FLY ANGLERS are blessed with a cornucopia of books on pretty much everything related to their sport. Perhaps the most abundant genre of fly fishing literature is the destination guide, showing anglers where, when and how to fish. Chances are good that you own one or two of these books, and the chances are also good that even if you’ve been lucky enough to own some of the better ones, you still had to go elsewhere for information on preparing to fish a particular destination. If so, you’re a lot like Colorado angler Steve Schweitzer. Finding an easier way led Schweitzer to spend the last decade logging countless hours on Rocky Mountain National Park trails, collecting photos, fishing, and researching his new book, A Fly Fishing Guide to Rocky Mountain National Park (Pixachrome Publishing, January 2011, 256 pages). The labor-of-love part shines through on each page of the self-published book, which covers 155 stream, river and lake fishing destinations inside the Park. Schweitzer covers every aspect of fishing the park. From its history and geography to background information on the Park’s visitor statistics; to trail and road information; to entrance fees and regulations; to an in-depth section devoted to hiking the Park, which is followed by an overview of Park hazards and a first aid primer. Next, Schweitzer covers guidelines on essential fly fishing gear and offers a rundown on how to approach various weather conditions and water types. He goes over each of the Park’s five major species of trout, outlining how to identify them, where to find them, and how to present a fly to their liking. And then he gets into the meat and potatoes of the book, the guide, itself. 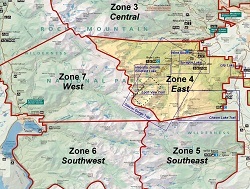 Schweitzer breaks the Park into eight zones. Each zone has its own section of the book devoted to it, where Schweitzer tells the reader about each trail in the zone and the water bodies you’ll find along the way. For each trail, Schweitzer first gives the reader an overview of the trail by including a topo map and trail profile illustrating the elevation changes along the way. Each trail’s grade is shown, so anglers can easily distinguish those that are a walk in the park (no pun intended) from those that will require more advanced backpacking skills. For each water body along each trail, Schweitzer shows which fish species are present, and gives an in-depth rundown on everything the angler can expect upon his or her first encounter. Next, Schweitzer has included a section devoted to fly patterns. In it, he shares over 100 recipes with the reader, each of which is accompanied by a photo of the finished pattern. Finally, Schweitzer has included an excellent appendix, which includes such invaluable information as: area fly shops, hatch seasons and hatch charts, a complete table of streams and lakes in the Park, 20-year average snow-free dates, a list of lakes over 10,000-feet, a list of trails ranked by difficulty, and a complete list of references. The only thing you won’t find in A Fly Fishing Guide to Rocky Mountain National Park are excuses. Without a doubt, this book will become the gold standard that all future fly fishing destination guide books aspire to, and are measured against. 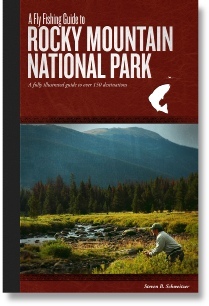 For more information on the book, you visit its Web site: http://www.flyfishingrmnp.com/.